It is exactly a year since the announcement of the UAE Energy Plan 2050, the country’s first energy strategy, and one that will serve for the next three decades. Increasing the contribution of clean energy to 50 per cent, and simultaneously, reducing the consumption of individuals and institutions by 40 percent is expected to save the UAE as much as Dh700 billion by 2050. The national strategy is designed to achieve both economic and environmental goals, and by all measures, it is not merely in motion but gaining rapid momentum. With a targeted energy equation of 44 per cent clean energy, 38 per cent gas, 12 per cent clean coal and 6 per cent nuclear, the bandwagon is also broad enough to accommodate variability and diversity. The multi-pronged Dubai Clean Energy Strategy serves as a noteworthy example. Launched in November 2015 – with the intention of producing 75 per cent of Dubai’s energy requirements from clean sources by 2050 – the strategy encompasses activities under infrastructure, legislation, funding, capacity and skill building, and an environment-friendly energy mix. 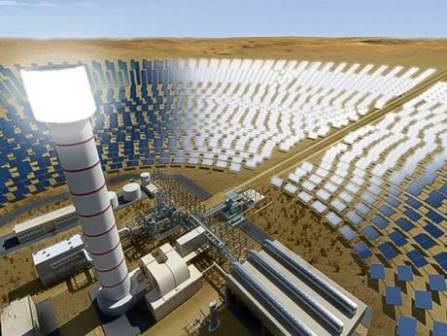 Part of Dubai’s strategy includes building the world’s largest Concentrated Solar Power (CSP) project and begin generation within the next five years to deliver inexpensive power at less than 8US cents per kilowatt-hour. The CSP project is located at the Mohammad bin Rashid Al Maktoum Solar Park, the largest single-site solar park in the world based on the independent power producer (IPP) model. The 40sq km park in Seih Al Dahal is expected to generate 1,000 megawatts (MW) by 2020 and 5,000 MW by 2030, and will reduce approximately 15,000 tonnes of carbon dioxide annually. In Abu Dhabi, the 2.5sq km Shams 1 launched in March 2013, is not only the world’s largest CSP plant and the first utility-scale commercial solar project in the region, it also features several industry innovations. For instance, purpose-built booster heaters that use natural gas to increase the resulting steam from 380C to 540C enhance the steam turbine’s efficiency and production, while a dry cooling system to condense exhaust steam flow significantly decreases water usage as compared to similar facilities. With a sizeable dip in global demand for gas and coal fired turbines, growing demand – and support – for all forms of renewable energy has been creating a new dynamic. This charged space needs to strike a fine balance, says Russell Stokes, President and CEO of GE Power. In the UAE, this is perhaps best witnessed through Waste-to-Energy(WtE) projects in different emirates. In Sharjah, besides commendable efforts spearheaded by the public-private partnership Bee’ah, a WtE plant in Sajja is expected to convert 99 per cent of 400,000 tonnes of organic waste into 80MW of electricity annually. In Abu Dhabi, the 100,000sq.mt, 100MW WtE facility under development by Abu Dhabi National Energy Company (Taqa) and the Centre of Waste Management (Tadweer), will become one of the world’s largest. When ready, the facility will generate enough power for 20,000 households and reduce carbon emissions by 1 million tonnes per year. Dubai is constructing a Dh2 billion facility at Al Warsan 2 that can process 2,000 metric tonnes of waste daily during the first phase of operations to produce 60 megawatts of energy. In Ras Al Khaimah, a 2MW WtE facility is already operational. Fatima Al Foora Al Shamsi, Assistant Undersecretary at the UAE Ministry of Energy points out that while renewable energy technologies can help address many issues, it cannot remain the sole solution. “The UAE Ministry of Energy is finalising the UAE Water Security Strategy 2036, focusing on aspects including interconnection of water networks, water storage, additional capacities of desalination, and recycled water,” she announced in the Ministry’s report, UAE State of Energy 2017. “Additionally, a Sustainable Transport Strategy is also under development to align with the new strategy direction of the energy sector, which will include a focus on the electrification of transportation.” Both these strategies are expected to align with the objectives and goals of the UAE Energy Strategy 2050. However, these goals set by the UAE stand as a tall order even on a global scale, and will take close and tight cooperation between the public and private sectors to achieve them, cautions Dr. Raed Bkayrat.